Did Santa bring you everything on your ‘wish list’ this Christmas? If not, and you have a few gifts to return, you should checkout the new tools available through the USPS website. This year the Post Office is making it quicker and easier to pay, print and ship a package from home. Recent Gallup polls show that the average US Household will spend about $740 on Christmas holiday gifts this year. That’s ~ a $35 increase from their November budget estimates, but it’s still down in comparison to the average household spend in 2012. 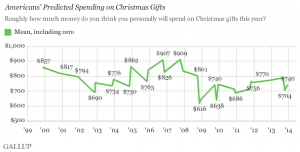 (Gallup) This means even more competition among retailers ! 1. Extend your hours – Open early and close late! 2. Entice shoppers with an offer or discount that’s hard to refuse. 3. Give away something for free! Even if it’s a something small. 5. Offer different payment options, including Lay-Away for large purchases. Get Your Holiday Offer in the Mail! Are you planning a Holiday Mailing this year? If you’ve already launched your campaign, well done! You’ve mailed it far enough in advance to encourage those early holiday shoppers. If you haven’t had a chance to mail your campaign yet, don’t worry, you still have time! But don’t procrastinate much longer , you’ve only got a few more weeks to get it dropped in the mail. Holiday Offers are a great way to reach out to current customers and potential new ones. People are expecting to see promotions around this time of year, and you want to make sure they know about all your great offers!